So, given that whatever happens tonight must be sufficiently ‘nutritious’ to feed us for an entire summer, what does Sñr González have planned? It begins with a percussion conversation. After an initial splash, González keeps the dialogue panning back and forth between Roca and Gutiérrez. Then all 12 horns come in together: long sustained unison notes, muted trumpet ‘vocals’, heavy tuba bass end, and through all the bombast and fury, the scrape of a cymbal reminds us there’s more than just ‘heavy’ metal in this ensemble… there’s also gongs, shakers, rattles, and of course, drums and in these early stages, it’s the twin percussionists that are adding a lot of colour to the sound picture. 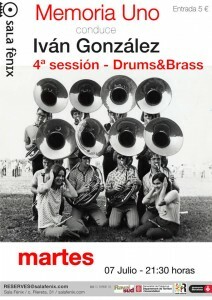 However, the massed brass, throws up its own interesting variations: it does seem that some notes are practically at the limits of human hearing (both high and low) oscillating across the boundaries and setting up sympathetic vibrations in the inner ear – to put it another way, being in this audience is a fundamentally physical experience! Then, as ever, structure emerges, is constructed, from chaos. everybody settles into a tuba-driven rhythm. With blaring colours across the top end and a double-drum beat underneath, the word ‘groove’ is vastly overused these days but sometimes no other word will do. For a fleeting and lovely moment, the drama coalesces into a wonderfully twisted, deformed version of mid-20th century big band jazz. Then nature (and entropy) takes its course and … deconstruction, dissolution, leaving a single fragmented trumpet; before the trombones take over, everybody rejoins in a barely musical interjection of pure sound, and… we… pause… (for applause). An added touch of structure for the second construction, there’s actual sheet music on stands and elements of a composed piece are used. As a result, there’s a certain architecture present, but no shortage of opportunities to stretch out. 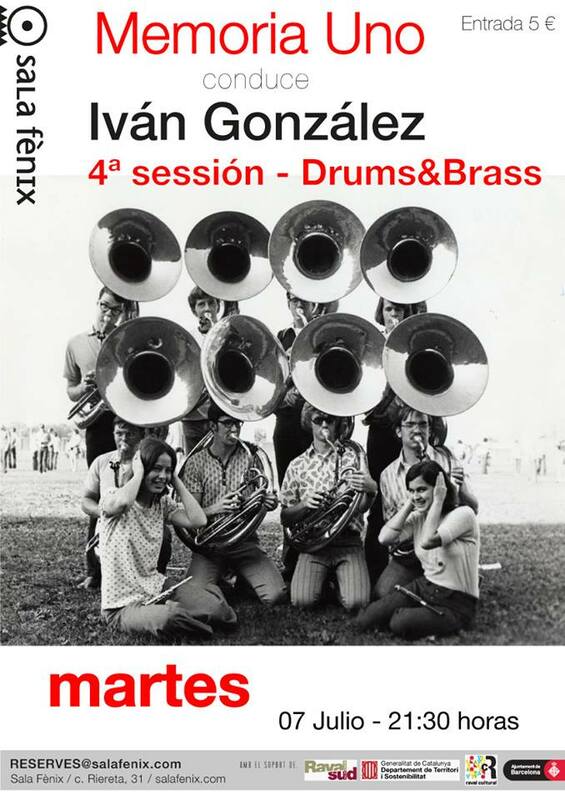 A low drone builds, and a French horn melody emerges before being eclipsed by thunderous drumming; González indulges in some rapid cuing of different musicians, then Filitrae takes a prolonged and gargling trombone solo. As the drums and everyone else joins in, Filitrae surfs thewave, becoming more vigorous, more outlandish and outspoken in his expression… Crescendo and fin. Now for the guests… Tom Chant joins for the third ‘conducción’ and after a brief fanfare of brass, he’s given free rein to offer up a sparse and jagged solo – more Chant than even Chant usually is (i.e. harsher, sharper, more piercingly direct than even his norm) – there are jabs and jerks of sound, harsh, almost desperate, like some kind of ritual killing, although what exactly is in its death throes here probably differs for each listener. Via a series of mechanical-industrial wails and screeching moans, we arrive at a lurching drum rhythm; some of the others (trombone, tuba, French horn) get brief chances to ‘step forward’… then Yolanda Sey Asare is given notice… the rhythm speeds up, shifts and we have… “Theme de YoYo”. As choices go, it’s both perfect and blissful: the high-energy rhythm, the free blasts of brass, and Asare does a great vocal rendition in the spirit of the Fontella Bass original. Cue suitably abandoned solos from tenor, trumpet and trombone, in turn; random percussion interventions as anyone momentarily unemployed reaches for a tambourine or similar noise device (pretty sure I saw Miguelon squeezing a rubber-bulbed horn). Finally, the cacophony fades for the final time, there’s a final peremptory bark from Chant and that’s it for the Summer. (If you can’t bear a few months without the most ambitously insane big band on the planet, Memoria Uno’s disc “Crisis” is available from Bandcamp, or Iván González direct via rubencin_83@hotmail.com).